Charlestown is the capital of Nevis and is a pretty West Indian waterfront town set on the West coast. Even though it is the capital, the town is small without ever being really crowded and it is a lovely place to spend an hour or two wandering around the interesting network of streets. The Charlestown market has local fruit and vegetables on sale and in the heart of the town on the main street you will find the banks, businesses and the tourist information offices. There are two lovely squares in the centre of Charlestown where some of the prettiest stone and wooden buildings are located. The Nevis Botanical Gardens are spread over 7 acres and displays plants and flowers from across the tropical world. They are laid out in several areas covering different environments including the Tropical Vine Garden, the Orchid Terrace, the Rose Garden and the Rainforest Conservatory. Nevis boasts some of the loveliest plantation inns in the Caribbean. A visit for lunch, dinner or afternoon tea is a wonderful way to get a feel for a bygone era. Two of the most well known plantation houses are the Hermitage Plantation Inn and the Montpelier Plantation House which date back to the late 1600s. They are some of the finest wooden buildings in the Caribbean. Fig Tree Church which was originally built in 1680 was the location for the marriage of Horatio Nelson and Fanny Nisbet in 1787. Fig Tree Church is located 3km from Charlestown on the round island road. Here you will find an exceptional collection of the famous Admiral’s memorabilia. A visit to the Brimstone Hill Fortress is well worth a visit while you are on Nevis. It is a UNESCO World Heritage site that is one of the best-preserved historic forts within the Caribbean. Nevis is particularly good for hiking. If you enjoy a good hike, you might enjoy a climb to the top of the stunning Mount Nevis – a dormant volcano. It is a tough walk and the views from the top are usually obscured by clouds, but its well worth it just for the climb itself. There are also many historic plantation ruins to explore, some set among lush rain forest greenery. There are several companies that will bring you on escorted walks which range from nature walks along old island paths, through the rain forest, bird watching tours and visit to local villages. The Four Seasons resort where many of our luxury vacation rentals in Nevis are located is top class. Take your golf game to the next level with professional instruction, a driving range and a putting green. 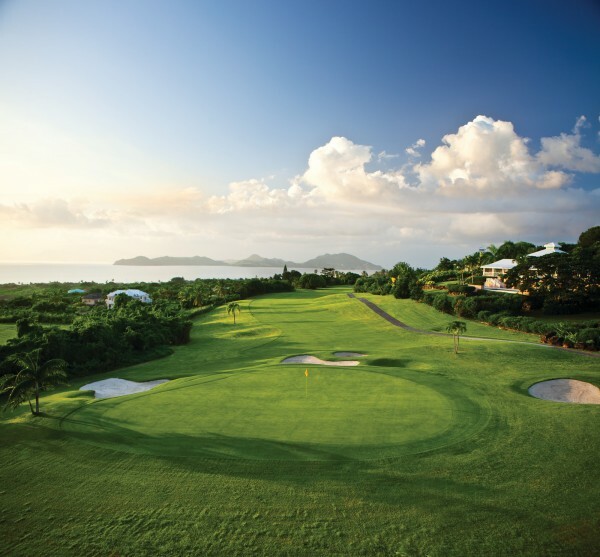 The par-71 course which was designed by Robert Trent Jones the second, features a dramatic view of the Resort and the neighbouring island of St. Kitts. Nevis is great for mountain bikers of all levels. There are simple road excursions through local villages to hard-core single tracks. You can take a ride for example on the historic upper round road which once linked the higher sugar estates. There is also an annual triathlon which is held in March out of Charlestown. The beaches in Nevis are particularly beautiful and because of the volcanic nature of the island they can vary greatly from pristine white to jet black. Oualie Beach which overlooks St Kitts is the most active with lots of water sports opportunities. The 3.5 miles of golden sand on Pinney’s Beach is stunningly beautiful made even more so by the back drop of the Nevis Peak. Pinney’s Beach is perfect for swimming and you will find some of the most luxurious vacation rentals in Nevis here. Lover’s Beach at the northern tip of the island, although hard to get to and sometimes windy is a lovely remote stretch of light covered sand. The Nevis equestrian centre provides both leisurely beach rides on Pinney’s Beach and more difficult trail rides in the hills as well as riding lessons if you wish. The Four Seasons in Nevis offers tennis facilities including 10 courts and ample services and amenities, including night play and professional instruction. Managed by world-renowned Peter Burwash International, the site comprises four red clay courts (two lit for night play) and six hard courts (three lit for night play). Equipment, apparel and accessories are available from the pro shop, located in the sports pavilion. 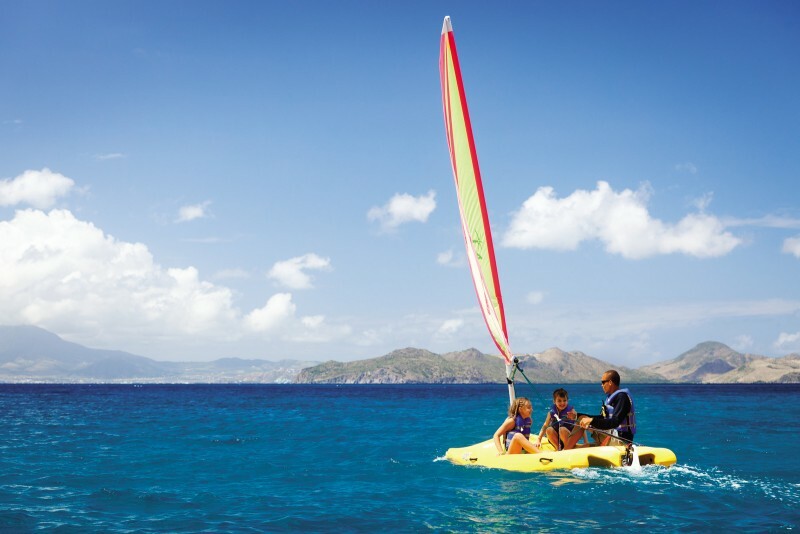 Visitors will find many opportunities for water sports in Nevis. Everything from waterskiing, wakeboarding, knee boarding, tubing, kayaks, wind surfing, banana boats and sailing are available. Although Nevis is not famous for its Scuba Diving, there are some spectacular dives that are definitely worth while doing. One of the best places is along the South Eastern peninsula of St Kitts which can easily be reached from Nevis by boat. Divers can expect to see good reefs, pinnacles, drop offs as well as some interesting tropical fish. There are also some wonderful wrecks further North West off the coast of St Kitts. As well as scuba diving, Nevis offers some really outstanding snorkelling. Reefs can be reached from many of the beaches but some of the best reefs are along the undeveloped bays of the South Eastern peninsula of St Kitts. There is excellent deep sea fishing to enjoy off the coast of Nevis. Charter a boat for a day or half day and catch barracuda, mahi mahi and marlin. The stretch of water that separates St Kitts and Nevis called The Narrows is excellent for sailing and a wonderful way to spend a day exploring the area. Day sails tend to go to the isolated bays of the south eastern Peninsula in St Kitts. Some of the charter boats will stop for snorkelling, drinks and even a barbeque on the beach. The Caona which is a 14-metre (47-foot) custom-built catamaran with a large foredeck, a covered area at the rear and a full, private washroom. The Eagle is a 20 meter (67 foot) catamaran once known as the fastest racing boat in the Caribbean. The Spirit of St. Kitts is 24 metres (78 feet) long with spacious decks as well as a large, comfortable saloon with a horseshoe bar and a few tables. Feisty is a 12.5-metre (41-foot) sloop built by Hunter Marine of the United States. She is luxuriously equipped for comfortable sailing with a queen-sized aft master cabin with en suite washroom and shower, and a double forward cabin with an en suite washroom and a convertible saloon. Star is a 17-metre (55-foot) Marco Polo L. Francis Herreshoff schooner that has been chartering in Nevis for 20 years.